Kickstart repositories are released when new minor releases of Red Hat Enterprise Linux are released. Kickstart repositories are NOT updated with errata. 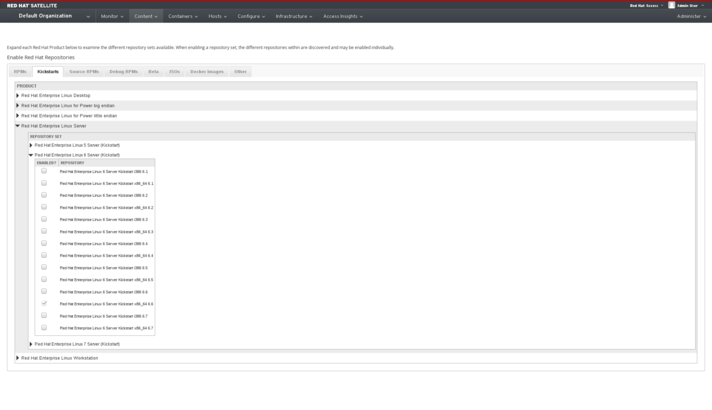 If you wish to provision systems with Red Hat Satellite 6, then you MUST select a kickstart repository. Red Hat Software Repositories are provided for each product that you have access to via your subscription manifest. Many repositories are released with a dot-release (6.1, 6.2, 6.3, etc) and a xServer (e.g. 6Server) variant. 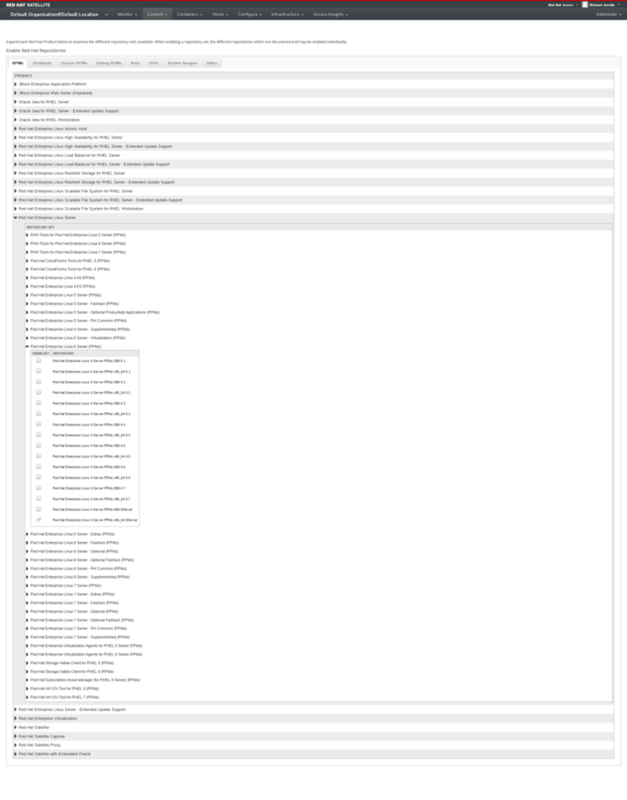 Each dot-release repository contains ALL errata (security, bugfix and enhancements) from the GA of that product until the next minor release. At this point, these repositories receive no further errata. 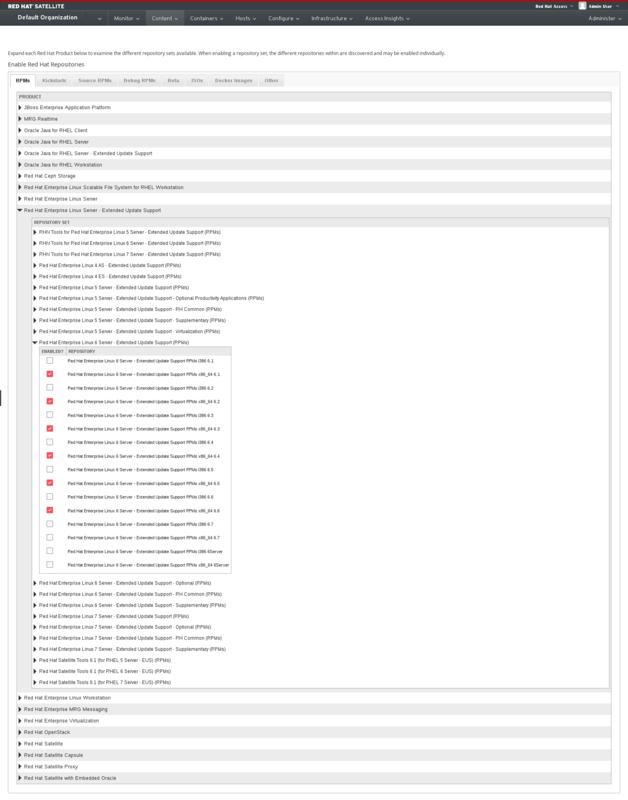 In contrast, the xServer (6Server, 7Server) repositories are updated with ALL errata (security, bugfix and enhancements) from the GA of that product until the product is no longer supported. The Red Hat Enterprise Linux 6 Server RPMs x86_64 RPMs 6.6 repository receives ALL security (RHSA), bugfix (RHBA), & enhancement (RHEA) until the date that Red Hat Enterpise Linux 6.7 is released. The Red Hat Enterprise Linux 6 Server RPMs x86_64 RPMs 6Server repository receives ALL released security (RHSA), bugfix (RHBA), & enhancement (RHEA) for the entire life cycle of Red Hat Enterprise Linux, and will always be as current as the Satellite's last sync with the Red Hat Content Delivery Network. The Red Hat Enterprise Linux 6 Server - Extended Update Support RPMs x86_64 6.6 repository receives all ALL security, bugfix, and enhancement errrata until Red Hat Enterprise Linux 6.7 is released. Afterwards, it only receives the selected backports as per the EUS inclusion criteria. It is recommended to use the xServer (6Server, 7Server) repos for Red Hat Enterprise Linux (in non EUS cases) as they provide the most flexibility with Content View Filters. Content View Filters provide a means to restrict which packages and/or errata are available as part of a Content View. This allows the end-user to customize their core build to match their requirements. Do not mix the xServer (6Server, 7Server) repos with the dot-release repos. A system has a single release version. Mixing the repository types will lead to HTTP 404 (file not found) errors when attempting to install packages. Content View filters can only restrict content that is provided by the repository. They cannot be use to include content that is not provided via a repository that is not part of the content view. Incremental Updates, a part of Satellite 6.1 Errata Management functions similarly, and does not allow usage of content that is not provided by a repository that is part of the content View. Add the Red Hat Enterprise Linux 6 Server RPMs x86_64 RPMs 6.5 repository to your content view and republish it. 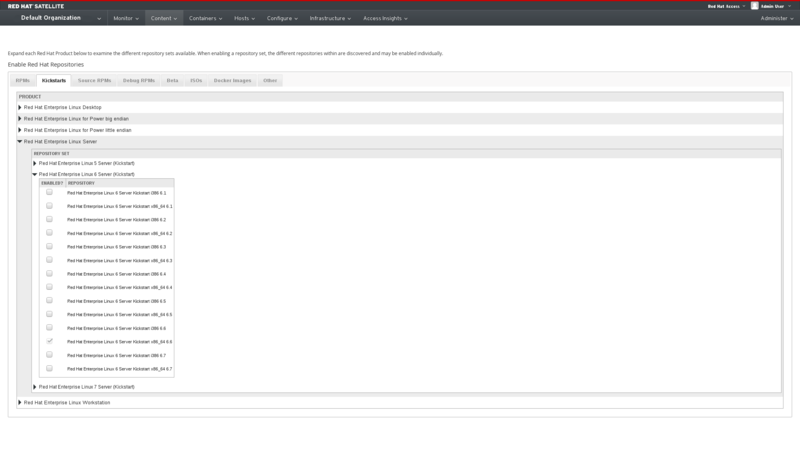 Add the Red Hat Enterprise Linux 6 Server RPMs x86_64 RPMs 6Server repository to your content view and republish it. You would not be able to apply it via the Incremental Update process. As such, it is recommend to not leverage the dot-release repos unless you are comfortable with the caveats. The command above to set release # to 6.6 should be "subscription-manager release --set 6.6"
Hi Rich, so if I have a content view for instance, with repos that only have 6Server, and I have a server running 6u9, but the content view is in synced with latest 6u10 kernel, how do I makes sure that only erratas compatible to 6u9 gets updated? I know that we can create a filter and limit it to only get up to the last update before 6u10 but no new erratas will be received by the client. Or is the only way to get updates is to upgrading to 6u10 as well? Hey John , you may want to create an 6U9_EUS_CCV or 6X_Eus_ccv where ccv is compost content view , with a OS content_view and satTool_content_view. As you could still get updates for #2 years, would be your patch train cadence for maj/min version.